The United States Mint will soon introduce the first $1 coin in a multi-year program honoring American innovation and innovators. The U.S. Mint has not yet unveiled finalized designs for the 2018 American Innovation $1 Coin. Based on Mint descriptions, they will look similar to the two candidate designs shown above. 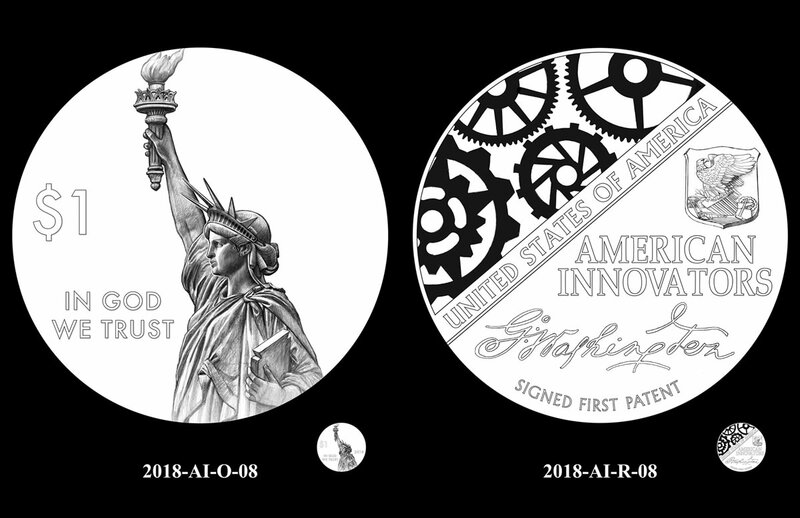 On Dec. 14, the U.S. Mint will release an individual proof and rolls and bags of uncirculated 2018 American Innovation dollars. Product pricing so far ranges from $32.95 for a 25-coin roll to $111.95 for a 100-coin bag with options of dollars from the Denver and Philadelphia Mints. The $1 coin in proof quality, which features frosted designs against mirror-like backgrounds, comes from the San Francisco Mint. Its pricing is unavailable as of this writing. Update: The price for the proof dollar is $6.95. The U.S. Mint has yet to unveil finalized designs or images of the Innovation dollar. In September, candidate designs were reviewed by the Commission of Fine Arts (CFA) and the Citizens Coinage Advisory Committee (CCAC). The pair of panels liked the same design for the obverse but preferred different reverses. It appears that the Treasury Secretary went with the CCAC’s recommendations. The obverse design will be shared across every dollar in the series. As described by the Mint, it features a representation of the Statue of Liberty in profile with the inscriptions "IN GOD WE TRUST" and "$1." Reverses change for each innovation or innovator honored. Because it introduces the new program, the reverse for the 2018 dollar features a representation of the signature of President George Washington on the first U.S. patent. Inscriptions include "UNITED STATES OF AMERICA," "AMERICAN INNOVATORS," and "SIGNED FIRST PATENT." Stylized gears at the top represent industry and innovation. Edges of all $1 coins are incused with their year of minting, a mint mark, and "E PLURIBUS UNUM." The American Innovation $1 Coin Program is a 15-year series honoring innovation or innovators in each State, District of Columbia, Puerto Rico, Guam, American Samoa, U.S. Virgin Islands, and Northern Mariana Islands. Going forward from 2018, they will be released at a rate of four per year. Next year’s designs will celebrate American innovation/innovators from Delaware, Georgia, New Jersey, and Pennsylvania. These and other upcoming issues will be released alongside the series of Native American $1 Coins which showcases an annually changing design that celebrates the important contributions made by Indian tribes or individuals. As much as I love collecting coins, this is RIDICULOUS! As if the millions sitting in the warehouses weren’t enough and what it costs to store them. Now they want to mint 2 different dollar series each year??? This is just a big way to make more profits from us collectors… Yes, I’ll be purchasing the proofs for sure, but that’s beside the point. States won’t follow Canada’s lead along with other nations as well. If the US stubbornly continues to issue low denomination paper money, use the invention design on paper money not unneeded dollar coins. Edge printing is useless to most collectors. What use is the mint mark and date except to make a coin more collectable? Also the US should follow Canada’s lead and stop making cents. From a collectors point of view that would not make me happy but maybe the mint would do something good for collectors as opposed to investors. spent enough on presidential dollars. Don’t need these, and neither does the country. just plain stupid. More overpriced so called coins. Will not be buying. Matter of fact, I stopped buying all of their overpriced stuff. Another collection of paperweights….. really the Prez $1 faded @ the end this is a bust……. Rather than making a useless $1 coin that no one much cares to collect, or will ever use, why not make this series in Silver coins? I think there would be much more interest. I know I would be interested in this. Really good thoughts and points taken. I understand/and agree with most all of what you said, except this,” Making more $1 coins is useless under current conditions. They are being made for investors not collectors”. I agree those $1 coins are useless under current conditions, but I don’t think they are being made for investors. With no limits on mintage or high mintage, a coin that will not be circulated, little to no desire from the public, and also no real “Metal value”, be it gold or silver, I don’t think investors have any interest in this series. There would have to be some “variety” or “error” crop up to catch the eyes of investors. I consider myself a collector /investor, if there is such a thing. What a really, really LAZY & incomplete obverse! Did the WW1 Arteest come up with this drek as well? Who is the market & why, and the back is aas crowded as a subway car @ 5:15pm & the front looks like Yul Brenner’s head….. The other proposed designs were worse. A total waste, completely uncalled for. I agree we should follow Canada’s lead and stop printing $1 bills. But my biggest objection to this particular coin is what a dumb subject it is. Whose idea was this anyway? I don’t see a problem with the New Dollar. MINT works on a Budget, and making up for the loss of the penny must be enormous. So they come up with a New Design for a Dollar for Collectors. Either buy it and add it to your collection or don’t, its not that big of a deal. I bought three Rolls of each and 10 of the Proofs. I don’t see a need to cry or whine about it. The P & D sets are already on EBAY if you just want one of each. By the way, I don’t sell on EBAY. I buy only, never trade or sell.